Tuesday is here and again I’m happy to join up with Cathy at Words and Herbs for the view. Things still look warm, but the lows last night seem to have brought in the tiniest bit of frost which singed a few tomato leaves here and there in the vegetable garden. We’re living on borrowed time! I wish I had more to say but I’ve been distracted by the chrysanthemums and fall bulbs and time consuming things such as fall baseball and gymnastics. I’ve also had a bulb buying relapse and in a weak moment ordered many more snowdrops than I could possibly need. That and tulips… even though I recently said I wouldn’t buy any new ones this year. My suspicion is that I’m the only one concerned about this latest purchase, but now that I think about it further (since I have absolutely no idea where to place these latest purchases), I wonder how the tropical border would look with a large swath of tulips and a small throw blanket of snowdrops. I bet it wouldn’t look half bad! This entry was posted in annuals, fall, Tropical garden, Tuesday view and tagged fall, flowers, garden, tropical garden. Your border would look wonderful early in the year with your tulips and snowdrops! 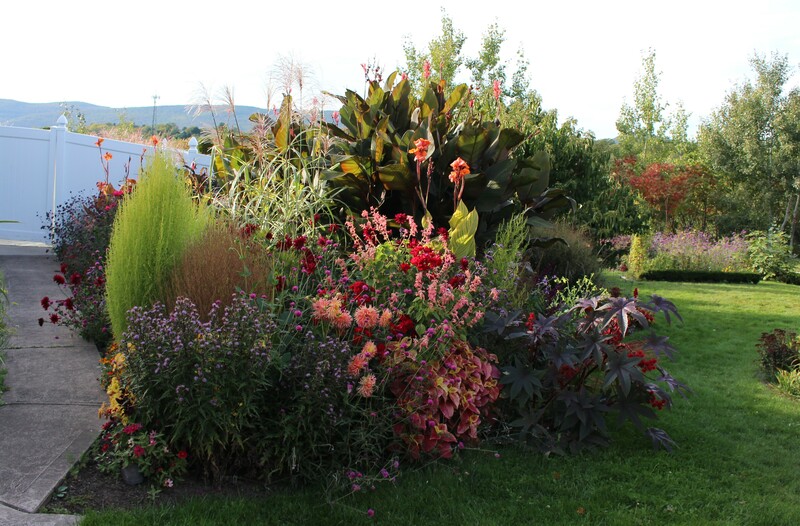 I really like the abundance of colours and shapes of this part of your garden! Thank you! I had my doubts that it would come together but now that everything is in bloom it’s wonderful. Yes, go for the tulips and snowdrops in the tropical bed for spring, it will look wonderful. I wonder where I could make a new bed for the tulips? Surely a little less lawn would be a good thing. Still looking gorgeous, what a pity that it will soon collapse. But tulips are a good idea for spring. More snowdrops? You really need more snowdrops? Ha, I always end up buying some bulbs that I think afterwards, where in the world am I going to put these?! Your garden bed looks beautiful. We are definitely living on borrowed time here too! I hear you got a stronger freeze…. we will probably get ours the middle of next week but I’m ready to clean up and move on. It’s so much easier to plant bulbs when a freeze clears things out! The tropics still looks grand! Your idea of planting your extra tulips and snowdrops there is excellent! Nice to know that there are other plant addicts who buy things first and find a place for them later! Haha, it’s you who are the inspiration to gardeners everywhere as far as spontaneous plant purchases go. I think if I had your nursery options I would really get into some serious trouble and be all the more pleased with myself for it!